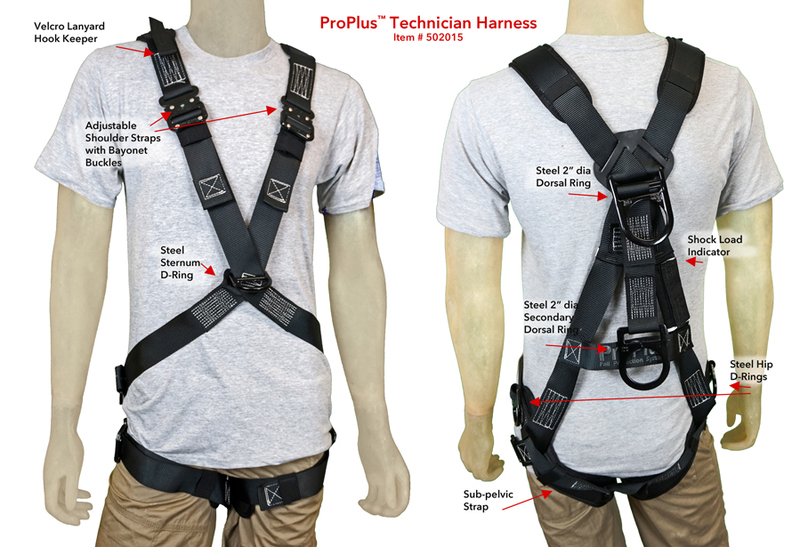 The ProPlus™ Technician™ harness is a general purpose full-body fall arrest harness for use by entertainment technicians working at height. The Technician™ harness has the added advantage of meeting the safety requirements when the work requires the use of multiple safety systems. Climbing a wire rope ladder to access a truss and then traversing along the truss is one example of a multiple safety system requirement. Per OSHA requirements only one snap hook or other connector can be attached to a fall arrest ring (e.g. Dorsal Ring) at any one time. The Technician™ harness is equipped with two Dorsal Rings, one of which is attached to a 9” web extension, thereby meeting the OSHA requirements and the needs of the work at hand. The Technician™ harness is comfortable and easy to adjust, making it ideal for both single and multiple user situations. This harness is ideal for everyday use in indoor and outdoor environments. Live Load Capacity: 400 lbs.